I worked with Astra dental implants for over 5 years, and went to several AstraTech courses in Sweden, as well as the Astra World Congress in New York. Here's what I learned about them! Astra dental implants are among the BEST in the world. They are made by swedish company AstraTech, originally part of the big AstraZeneca group. AstraTech produced its first dental implants in 1985, over 30 years ago! AstraZeneca was originally a pharmaceutical group. They developed and tested new drugs to see what they could do, and if they were safe. In order to get official approval for the small minority of drugs that showed promise, they had to document and record every single test and experiment. They documented all their research to pharmaceutical industry standards. So, when it came to researching and developing dental implants, they recorded and documented their research in the same way they always did for pharmaceutical products. No other firm did this at that time. This means that AstraTech now has the longest and best documented research for dental implants of any company in the world.What does this mean for YOU? It means that you can be confident about the quality of the implant you are getting. With over 30 years of research and experience, Astra implants are extremely safe and long-lasting. They have a success rate of 98% to 100%, higher than any other company. AND they have the documented research to prove it! Like a lot of dental implant companies, Astra offers training to dentists in how to use their products. There are courses in the surgical aspects of placing the implants, and also for how to put the crowns and bridges ONTO the implants, to give you the teeth you want! I went to one of their courses in Gothenberg, Sweden in 2006. I was very impressed with the quality of the training, and also with the implant design and research! Astra has done a LOT of research into dental implant design. They have come up with a number of innovations and hold a lot of patents to do with implant design. Some of these have improved the speed at which implants heal. This has to do with a special coating that is applied to the surface of the implant, called OsseoSpeed. This is a fluoride-based coating which seems to accelerate how the bone heals around the implant surface. Other innovations help prevent the gum and bone from shrinking around the implant. These involve the precise angle and depth of the screw threads at the top of the implant. This feature is called the MicroThread design. This helps to keep the gum line at the original level, instead of shrinking back and exposing the metallic implant surface. Each Astra dental implant costs several hundred dollars each. They are packed in special sterile packaging, and need several items of surgical equipment to place them correctly in the jaw bone. Plus the skill and training of the dental surgeon! Dental implant surgery is really a branch of orthopaedic surgery. 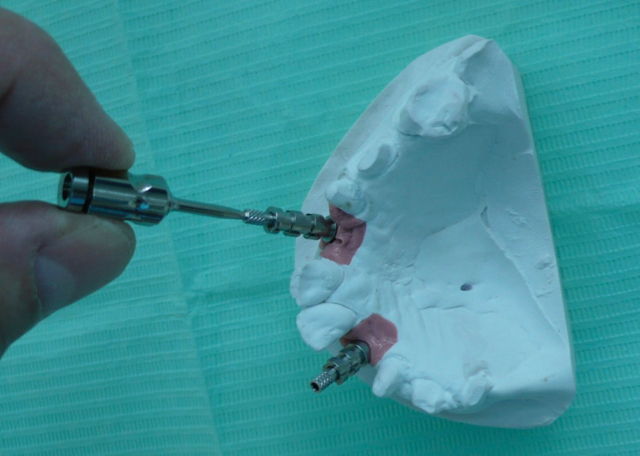 Below is a photo of two astra dental implant replicas mounted in a laboratory model, with impression "pick-ups" being fitted. Overall, AstraTech implants are a true quality product with bucketloads of powerful research behind them. If your dentist is using Astra implants, you know you're getting the best! American dental company Dentsply certainly thought so - they paid £1.8 billion for AstraTech in 2011 ! I'd have to warn you though - the dental implant market is fiercely competitive. If your dentist is using a different brand of implant, it doesn't necessarily mean you're getting worse quality. You could be getting something equally good, perhaps from Straumann or Bicon. But what I like particularly about Astra dental implants is the LONG track record of research and development. They really have done their homework, and EVERY little thing about their implant design has a reason.